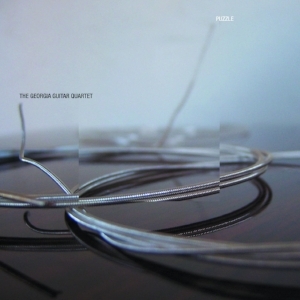 The Georgia Guitar Quartet (Kyle Dawkins, Brian Smith, Phil Snyder, and Jason Solomon) are a pioneering ensemble on the American chamber music and classical guitar scenes. These four musicians from the southeastern United States deliver a high-energy blend of breathtaking virtuosity and imaginative programming while taking an adventurous approach to classical music. Borrowing from both the past and present, the GGQ draws inspiration from the ever-evolving palette of music that has influenced them: classical masters such as Bach and Brahms, experimentalists in the vein of Cage and Stockhausen, and contemporary rock icons like Led Zeppelin and Radiohead. Audiences at a GGQ concert experience an exciting musical journey through an expansive array of genres, continents, and time periods. Accomplished composers themselves, the Quartet members frequently incorporate their own unique works into their dynamic concert programs. The incredible range and interactive spontaneity of a performance by the GGQ continually leaves audiences with something to remember, resulting in a thrilling new way to experience chamber music in the 21st century. Formed in 1996 and hailing from Athens, Georgia, the Quartet performs throughout the nation in venues ranging from concert halls to popular music clubs. Recent concert highlights include performances in New York, Los Angeles, and a performance of Rodrigo's Concierto Andaluz with the Utah Symphony Orchestra. The GGQ has been featured on American Public Media's Performance Today on dozens of occasions. Their five critically acclaimed albums include their own arrangements and compositions. Several notable composers have dedicated new works to the GGQ, including Russian composer Nikita Koshkin, whose Suite for Four Guitars quickly became an audience favorite. The group has collaborated with modern dance groups and visual artists to produce multimedia performances and has recently embarked on a new collaboration with lyric baritone Robert Sims. With Sims, the GGQ adds American spirituals, blues, German art song, and rousing show tunes to its repertoire. In 2001, the Quartet was invited by Christopher Parkening to perform as the guest artists at his Twenty-Seventh Annual Masterclass in Bozeman, Montana. Parkening, the recognized heir to Andres Segovia, praised the GGQ, saying "the Quartet performs with good energy and technique, applies careful attention to detail, and maintains a diverse repertoire." A review of their Piccolo Spoleto Festival performance in Charleston, South Carolina, described the concert as "a dazzling display of technical prowess, versatile programming, and audience rapport." The town of Athens, which boasts a rich musical heritage including R.E.M. and the B-52's, has honored the ensemble by awarding them "Best Classical Artist" in Athens five years in a row at the Athens Flagpole Music Awards.